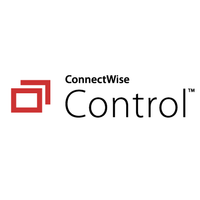 The ConnectWise Control Remote Support App for Freshservice allows you to create and join ConnectWise Control support sessions from the Freshservice ticket sidebar. Already a ConnectWise Control and Freshservice user? Use the install button and start exceeding service expectations with enhanced remote support. 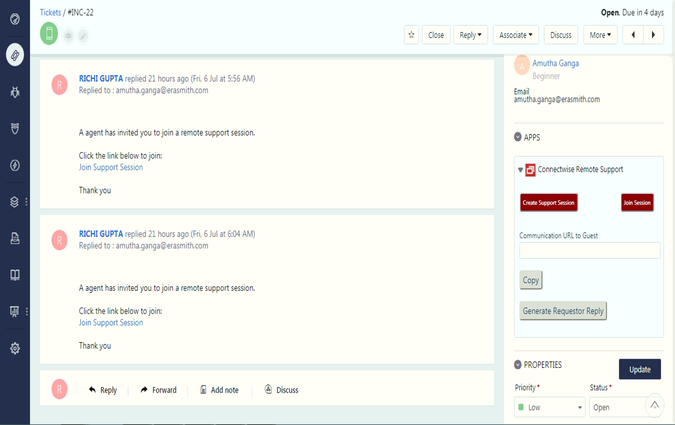 The ConnectWise Control Remote Support App for Freshservice allows you to create and join ConnectWise Control support sessions from the Freshservice ticket sidebar. ConnectWise Control updates the ticket with a note containing session summary information upon session end. These instructions assume that you have installed and configured the Freshservice Integration extension on your instance of ConnectWise Control. You will need the ConnectWise Control API Token displayed in the Freshservice Integration Settings dialog to configure the ConnectWise Control Remote Support App for Freshservice. Once you have installed this App from the Freshservice Apps Marketplace, you will need to configure two required settings and one optional setting. The setting "ConnectWise Control Base URL" is the base URL for the instance of ConnectWise Control with which you are integrating; for example, https://example.screenconnect.com. The setting “ConnectWise Control API Token” should match the value of the ConnectWise Control API Token setting displayed in the Freshservice Integration Settings dialog in ConnectWise Control. The optional setting “Freshservice White-label Text” is used to replace the reference to ‘Freshservice’ in the guest invitation reply and defaults to ‘Freshservice’ if left blank. Now that you have installed and configured the ConnectWise Control Remote Support App for Freshservice, navigate to a Freshservice ticket. The ConnectWise Control Remote Support App is displayed in the ticket sidebar. Click “Create Support Session” to create a Freshservice-integrated support session in ConnectWise Control. To join the session, click “Join”. If you’re not already logged in to ConnectWise Control, you will be prompted to enter your credentials. 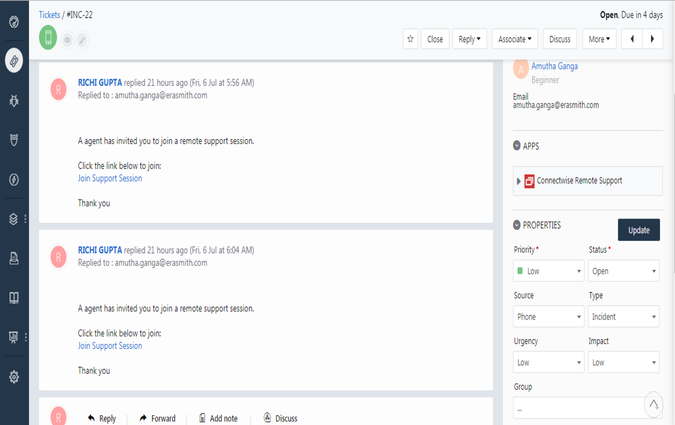 You may invite the guest to join the session by either communicating the URL displayed in the App or clicking “Generate Requester Reply” to open a new reply with pre-populated guest join instructions and a link to join the session. Conduct the ConnectWise Control support session as you normally would, then end the session. ConnectWise Control will detect the end of the Freshservice-integrated support session and update the Freshservice ticket with an HTML-formatted private note. 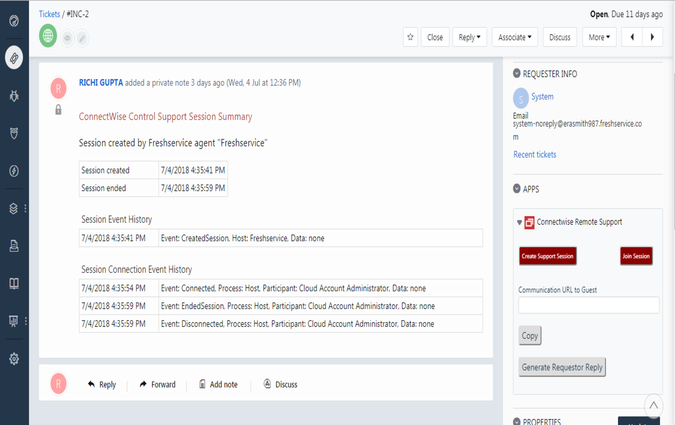 Depending on how the ConnectWise Control administrator has configured the Freshservice Integration extension in ConnectWise Control, the private note may contain the session chat transcript, session event history, session connection event history, session note history, and session capture download information. Once the user clicks on create support session, the links are generated for the session. If the user refreshes the page and clicks again on create support session, it will return the same url of the same session which is created previously.